Member Clare Tucker has been flying the flag for OUCH (UK) over the weekend. 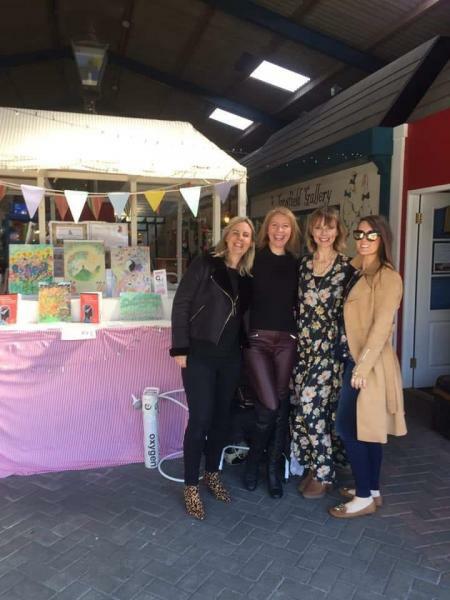 Clare has been having an art showing at Gosfield Shopping Village in Essex where she had her own stand. All of her art work has come from her CH - she didn’t paint prior to that. On her stand, Clare has her display of paintings, plus OUCH booklets and leaflets as she wanted to explain why she was painting. If any of her paintings are sold, Clare has said she intends to donate some of the money to OUCH and will probably use a little of it to buy new materials to paint more and repeat the process. Thanks go to Clare and also a big thank you to her employers, FR Shadbolt & Sons, who have done everything possible to help Clare to keep on working for them from home. The company intend to fundraise for OUCH throughout the year and have already made a generous donation. Huge thanks Clare, and it's great that something so positive has come out of something so awful as CH, if you see what I mean! I see the trusty 02 and DV are with you!